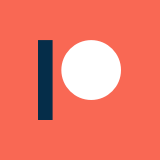 This post is based on a viewer request, which is being filled due to a donation to the Secular Student Alliance via my fundraising page during Secular Students Week (June 10-17, 2015). That means that you still (at the time of this publication) have a day to donate and have your request filled! Today, I’m going to be taking a look at a couple of films based on Roald Dahl’s book, Charlie and The Chocolate Factory: the charming 1971 classic, Willy Wonka and The Chocolate Factory, directed by Mel Stuart and featuring Gene Wilder, and the 2005 re-imagining helmed by Tim Burton and starring Johnny Depp, which used the original book’s title. Willy Wonka, is, of course, one of the most widely beloved family movies in history. Gene Wilder’s performance, the visual style, and the memorable musical numbers all made for a fantastic experience that has lasted well through the years. When it came time for the inevitable reboot for the classic flick, Tim Burton was the choice to bring Wonka back to the screen. On paper, it makes sense to hand the reigns of a remake to one of the quirkiest and darkest children’s movies ever made to Tim Burton. At this point, he had shown that he was more than capable of making weird, dark, family-focused movies that could resonate with massive audiences. However, Charlie failed to see the kind of success of his previous films like Beetlejuice and Batman. For context, Charlie and The Chocolate Factory was made around the time that Burton’s career was only just starting to look less pristine than it once had. While his previous film, Big Fish, was generally well liked, his highly publicized remake of Planet of the Apes was not warmly received, and proved that Burton was more than capable of mishandling a film. However, no one expected Burton to become the critical pariah that he is now. The next few Depp / Burton collaborations were increasingly more reviled following Charlie, with the possible exception of Sweeney Todd (depends who you ask). 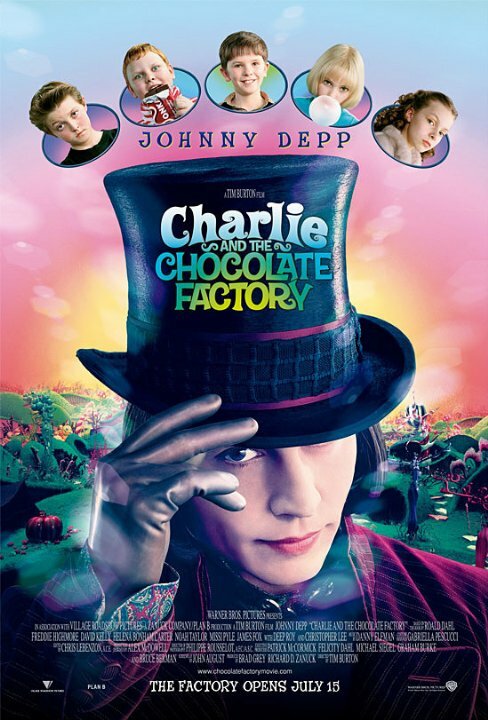 Charlie and The Chocolate Factory essentially marked the beginning of Burton’s and Depp’s steady fall from critical grace, which would later include Alice in Wonderland and Dark Shadows. Speaking on the introductory sequences, they also showcase another major difference between these films. Willy Wonka extensively uses practical effects throughout the film, which is primarily because the technology to do otherwise didn’t really exist at the time. If you do take a look at the few special effects that are present in the film, they are the most dated things in the movie by far (like the green screen use in Mike Teevee’s fall). On the other hand, Charlie might as well be a Star Wars prequel with the amount of special effects used to construct the other-worldly sets. We are now only 10 years down the line from Charlie’s release, and it already looks massively outdated and flat due to the rapid advances in technology during that time. That is unfortunately the nature of doing a special effects movie: they don’t age well, with very rare exception. On the flip side, Willy Wonka has still held on to most of it’s charm, because it only relies on gimmicks when it absolutely has to, instead favoring the construction of a tangible world of wonder. One of the keys to the success of the original Willy Wonka was the musical score, which created a number of memorable songs. For Burton’s take, long-time collaborator Danny Elfman was brought on for the music, who is one of the most acclaimed composers working today. Unfortunately, he totally missed the mark in Charlie. While the background music is pretty decent, the songs are totally forgettable, to the point that they seem phoned in. Willy Wonka has a beloved soundtrack that was of course going to be difficult to follow up on, but instead of paying respectful homage, Elfman went in an entirely different direction that just didn’t resonate with people. The music was frankly more than backdrop in Willy Wonka: it was a key to the emotional core of the film, helping to portray intense moments of sadness, longing, and joy in ways that dialogue alone couldn’t. Thus, the failure of the soundtrack to Charlie goes beyond just not providing decent musical interludes: it marks a failure to illustrate the emotions of the characters. For an example of this, The Chocolate Room introduction sequence exemplifies everything that is right about Wonka and everything that is wrong about Charlie. Wonka uses the song “Pure Imagination” to introduce the guests to his world, while also teaching us a little bit about Wonka’s misanthropic outlook: if you are paying attention, you come to understand why he is a recluse, and why he has chosen to live in the land of his creation. Humanity, essentially, just can’t live up to his standards for it, so he has willingly retreated away from it into a land of his own imagination. It is a really moving sequence, where Wilder gets to show off his emotional range as an actor, and give us insights into Wonka’s mindset without him explicitly telling us what he is thinking. Most people focus on the children in the sequence, but it is actually a much more interesting scene to watch with Wonka in focus and the purpose of the contest in mind. Charlie, on the other hand, just shows a room full of computer generated chocolate and candy, with narration from Wonka as if the audience is watching an industrial training video. Frankly, it’s dull, and lacks any of the emotional punch or potency of its predecessor. Depp’s Wonka just seems bored, like he is going through the motions. That isn’t the worst way to portray him, but it just doesn’t live up to the previous portrayal from Wilder, and lacks the powerful subtleties and emotions that were present there. I’m a big fan of the set design and visual style of Willy Wonka: the split-in-half office furniture, the human hands for coat hangers, and the various candy creations are all laced with visual ingenuity, in a way that a master, eclectic inventor would believably design things. This is usually something Tim Burton is particularly good at portraying, but in my opinion, the result with Charlie is something that is at once excessively alien and astoundingly flat. Willy Wonka‘s visuals are odd, but never lose a slight sense of reality and believability. Charlie might as well be an animated film for how it looks, even in segments where it should really appear realistic. This may be more of my personal preference than anything, because there are certainly fans of Burton’s visual style in Charlie, but I wasn’t a fan of it here. Of course, I have to bring up the style of Willy Wonka himself in these two films. There is an astounding amount of depth in Wilder’s performance, without any explicit detail ever being offered: you can tell that he is fatigued by the way he speaks and carries himself, sliding in a biting bit of humor here and there. I even adore his odd moments of randomly changing languages in the middle of a scene, which adds more flair of eccentricity and intelligence to him. Depp’s Wonka, on the other hand, is just a man-child: a Michael Jackson-influenced version of Wilder’s character, with all of the subtleties and wit sapped out. As much as that image might fit what people would imagine on paper for an eccentric candy man, it isn’t actually very interesting to watch. It is also worth noting that Depp, while being a good actor, isn’t nearly as talented at the comedic aspects of the profession as Gene Wilder, which certainly didn’t do him any favors in this role. When it comes to the humor in these movies, the writing for Charlie just doesn’t even compare to Wonka. The amount of sly humor in the background of Willy Wonka is part of what makes it so legendary, and at times makes it seem like an episode of Monty Python’s Flying Circus. 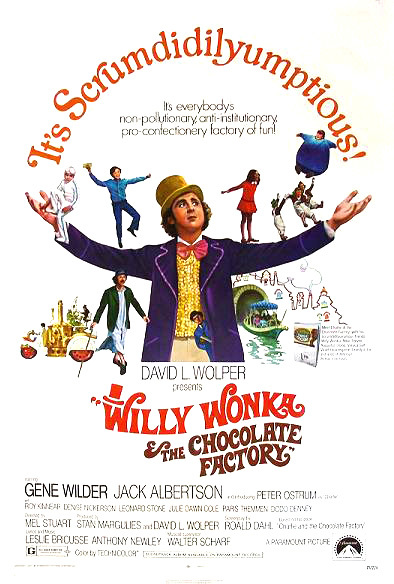 For instance, the scenes showing the fervor over the golden ticket sweepstakes are hilarious in Wonka: sequences like the indignant supercomputer, the Wonka bar hostage situation, and the teacher who can’t quite figure out how to calculate percentages are as golden as Wonka’s goose eggs. For comparison, the gags in Charlie are just weak. The accessory cast doesn’t get to do a whole lot, and Wonka’s quips aren’t nearly as surreal or vaguely menacing as they were in Wonka. Child acting is tricky, particularly when the characters aren’t particularly deep. Willy Wonka certainly didn’t hit 100% with the casting, but the kids were passable at least, and fantastic at best (like Veruca Salt, who I thought built a fantastically loathsome character with her performance). Burton’s Charlie, on the other hand, is filled with even more one-dimensional, obnoxious creatures, who suffer even further from being portrayed by half-assed child actors. Even the kid who plays Charlie himself is nearly unbearable. Last but not least, Burton’s Charlie provides a lot of extraneous information that isn’t essential to the story, and saps a bit of the element of imagination and wonder out of it. For example, explicitly showing the other children alive was unnecessary, and actually ruined some of the darker humor. Likewise, the Oompa Loompa homeland should really have been left to the imagination, because nothing could be shown that could live up what people concocted in their minds. Also, what is the point of meeting Willy Wonka’s dad? Every time there is a flashback to Wonka’s past, the story grinds to a halt, and the exposition about Wonka’s life is ultimately useless. I love Christopher Lee as much as anybody else, but his character just wasn’t needed at all here. Charlie might have included some of these things in order to be more faithful to the book, but that doesn’t necessarily make for a better movie. The Nostalgia Critic took a look at the comparison between these two films previously. I agree with him on most of his points, but he has a far more positive take on the Burton version than I do. Personally, I find it incredibly obnoxious and shallow, even for a children’s feature. I also think it actually marks the dramatic beginning of Burton’s slide into mediocrity, even more so than his take on Planet of the Apes. I will say that I didn’t hate Sweeney Todd, but the rest of his work over the past decade doesn’t even come close to the achievements of his career before that. If he didn’t have such a loyal, cult-ish following, he would be done for as a directorial force. To Burton’s credit, Charlie is a distinct movie made from his own vision, and he didn’t allow himself to be constrained or ruled by the classic film. I don’t doubt that this is exactly the film that he intended to make, and all power to him for doing that. However, it just isn’t very good, and is particularly not as good as the original. It just doesn’t seem like he was firing at all cylinders for whatever reason, because he is undoubtedly capable of better work than this. I will say that it definitely portrays the differences between the classes very well, which is a really important aspect to the story, but I don’t have a whole lot of positive things to say beyond that. I’m not one of those people who gets up in arms at every announcement of a film reboot: it is just a fact of the business at this point. I don’t at all mind new takes on classic stories, because that happens in all creative mediums, and oftentimes improvements come of them. For example, look at Charlie‘s Christopher Lee: his take on the character Dracula for Hammer Films provided a new vision of a classic, and one that has dramatically influenced the direction of the vampire in contemporary fiction. So, reboots aren’t always bad. That said, there is definitely a reason why people are so weary of the Hollywood reboot machine these days: the good products are few and far between, and Charlie and the Chocolate Factory is no exception. On the positive side, the release of Charlie and The Chocolate Factory exposed a whole new generation to the classic Willy Wonka, which is certainly a good thing. And, of course, Charlie has its share of fans who defend it, so it at least managed to resonate with some people out there. I don’t agree with those people, but there’s a reason why there are so many varieties of candy.